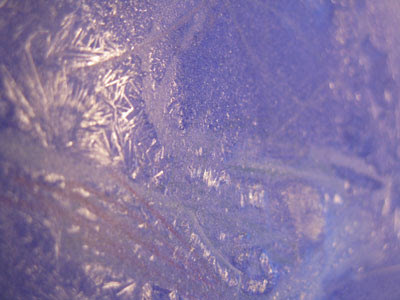 There's something magical about the crystal patterns on a frosted windowpane. The fern-like, random artwork by nature is one of the miracles of winter. Some say the art is the work of the legendary Jack Frost. We recently purchased and read a cute winter book about a boy who meets and plays outside with Jack Frost. '"Who are you?" asked the boy. A lonely little boy sulks about inside his house during a cold, gray winter until one morning he notices patterns on the window. When he looks outside he sees a pointy white, elfish figure, the character responsible for the patterns. The boy befriends the figure, Jack Frost, and they play together all winter long, sledding, throwing snowballs and building snowmen against a brilliant blue sky. Kazuno Kohara's stark white linocut images dance against the blue backgrounds, beautifully conveying the the wondrous bluish hues of winter. Even though she uses limited colors, Kohara still manages to add a special vivacity to her pictures. Kohara uses a similar illustration style in her Halloween themed book, Ghosts in the House! 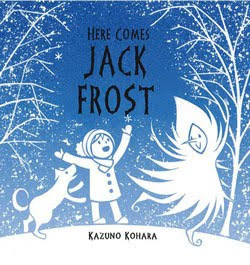 While the newer book, Here Comes Jack Frost isn't as humorous as the ghost book, it is a lovely, playful and fun winter read and a good, simple introduction to the character of Jack Frost. Obviously some sort of printmaking craft would be the perfect activity to accompany this Here Comes Jack Frost. But we've already tried two different printmaking techniques in January so we thought instead we'd pretend to be Jack Frost by making frost paintings using a special Epson salt solution. I first saw instructions for the Epson salt paint on Homemade Mamas. The recipe is simple - you combine 1/4 cup boiling water with 1/4 cup Epson salt. Then you stir until the crystals dissolve and let the solution cool slightly (a few minutes). The kids dip their paintbrush in the solution and cover the page with the liquid. 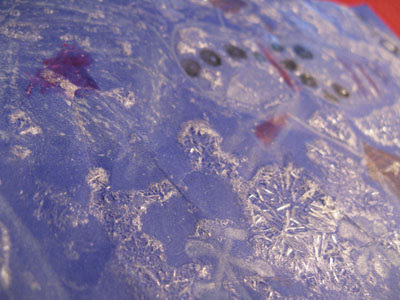 As the paint dries, it crystallizes and forms interesting, sparkly patterns. Unplug Your Kids also offers a detailed and interesting post about Salt Crystal Paint. In our experience, Epson salt paint is a rather unpredictable product. Sometimes it dries and lovely crystalline patterns form and other times all you get is an even layer of powdery white frost. If you supersaturate the solution by adding more Espon salt than water, you'll end up with really thick, crusty white coverage. It's fun to experiment, but it can also be rather frustrating for the kids if they want to see fun crystal patterns in their salt paint. We tried making two different pictures, one using crayons and another using paints. 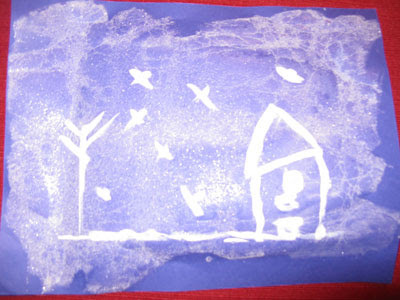 The wax in the crayon pictures seems to help break up the layer of paint and causes more puddling - thus more crystal patterns. My daughter crumpled her crayon drawing a bit before adding the paint, so that the solution could settle on an uneven surface. This also helped encourage crystal patterns and helped stop the picture from curling up as it dried. For an alternate craft to correspond with this book, visit Superheroes and Princesses. 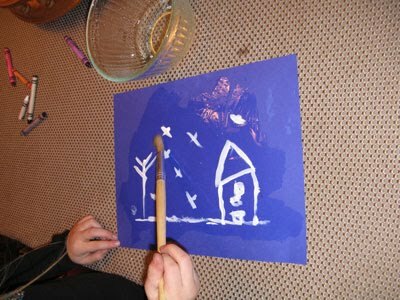 They created winter tree art using masking tape and paint. I have had epsom salt painting on my to do list for a while and have that same Unplugged post bookmarked. Thanks for all the tips. The illustrations are quite beautiful! And I love the activity idea--juliet would love it. I love the look of her pictures. We haven't tried this before, maybe soon. Thanks for the directions. Oh the book looks lovely! And what a fun idea to combine wax crayons and salt painting! The finished effect looks great! I love the concept of the book, Here Comes Jack Frost. So imaginative! 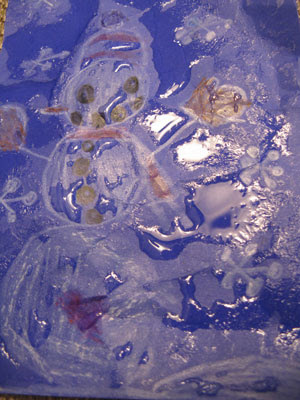 Fun idea to try painting with epson salts! I've used salt as a resist with watercolor paints. To try it, paint with watercolors as usual, and while the paint is still wet, sprinkle on a little salt for effect. Use a hairdryer to blow it dry and then, brush away the remaining salt crystals. This book looks great--I have a thing for wintertime books, for some reason. I usually love the illustrations! What a cute book! Down here in TX we don't usually get snow, but frost, so this would be a good one for our little ones. I enjoy stopping by each week to see what art activity you and the kids have done. Perfect project for the book! Love the effects! JJ loves this book and so do I! We love salt painting around here and that book looks good. I love the look of the cover. I have never heard about Epson salt painting, but it definitely sounds intriguing and perfect complement for this book. What a fun project. I don't have any little ones to do it with, but I know a few people who might want to do it with their little ones. The Jack Frost book looks like a fun book to read. I like the blue and white of the cover. Makes it look real wintery. 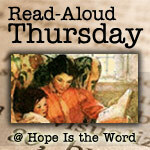 I'm coming from An Indiana Mom....she mentioned your blog with this activity! Just told my daughter about Jack Frost today and would love to share this book with her....yay! She asked me, "Is Jack Frost a person?" My father always told me when there was frost that it was "Jack Frost"! Thanks! Glad to find your blog!